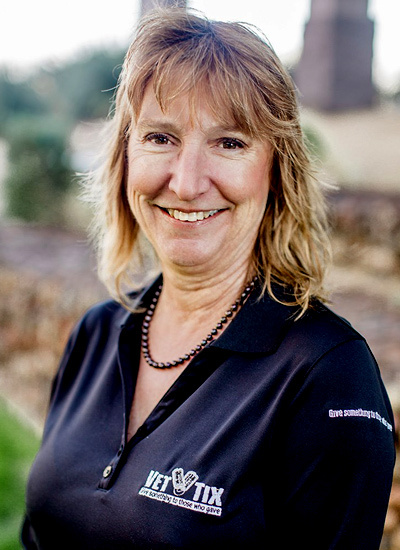 Cindy Creed graduated from Arizona State University in 1985 with a degree in Accounting. She is currently a partner in the CPA firm of Creed, Dietrich & Robinson. She married her husband in 1986 and they moved to Michigan and Kansas where Craig served as a Captain in the Air Force. Craig served for ten years and did a tour in the Gulf Conflict. Cindy's father retired from the Army and her son is serving in the Arizona National Guard as an MP and he did an 18 month tour to Afghanistan. Cindy, Craig and Rusty have also served with the Patriot Guard Organization. Cindy also served as the CVO of the Boys and Girls Club of the East Valley for the last two years. Cindy became involved with Vet Tix when Craig was tragically killed in a motorcycling accident in 2009 coming home from a Patriot Guard mission.